Time to eat. An Italian’s favorite thing to hear. I discovered al fresco‘s chicken sausage about a year ago in my local Hannaford. Since then? I cook with it’s different varieties a lot. Tonight’s dinner (part of the new “I can eat this” menu) uses the Spicy Jalepeño package. Directions: Cook 1 cup orzo according to package instructions. In a large skillet, add 1 tablespoon olive oil. Slice pepper and tomatoes, leaving the centers of the tomatoes intact (juices will add to flavoring). Toss these into the skillet. Cut sausage into 1/2-inch thick, round pieces and add to skillet. Cook on medium-high until sausage is 3/4 done. Add in shredded carrots and sugar snap peas. Cook mixed together until sausage is done. 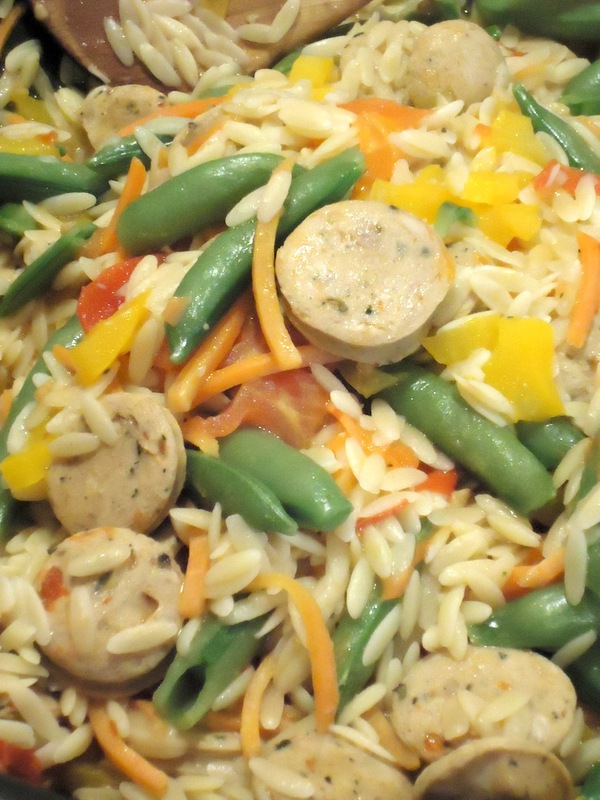 Once orzo and sausage are done, combine in skillet. Let cool down, then serve.